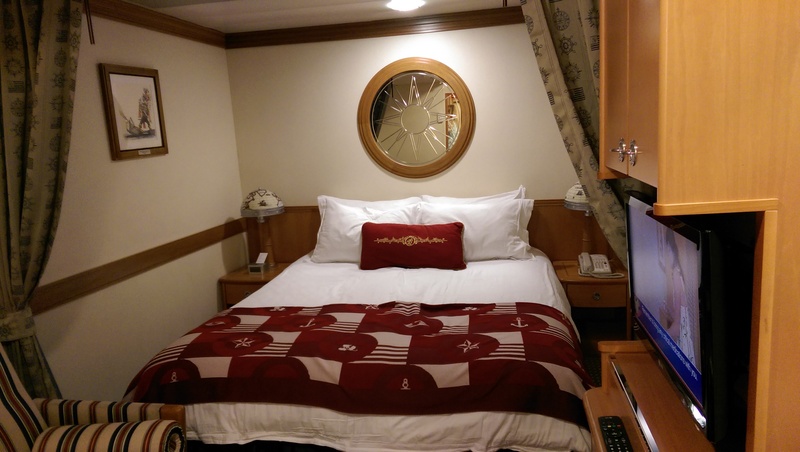 Have you ever wondered what a stateroom on a Disney cruise ship looks like? I’d never been on a cruise before we went early this month. My only reference was from the movie, Out to Sea with Jack Lemmon. 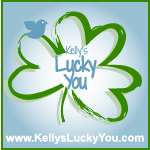 I was very excited to find that it was spacious, comfortable, well-decorated, and had amazing storage space. There was a dividing curtain between the bed, sleeping area and the sitting, couch area. That especially came in handy when I (the night owl) wanted to stay awake later. I love, love, loved all the drawers! It made it easy to organize and separate all our things. The TV was on a flexible arm that made it very easy to turn towards the bed or the couch. Having a refrigerator in the room is always handy! 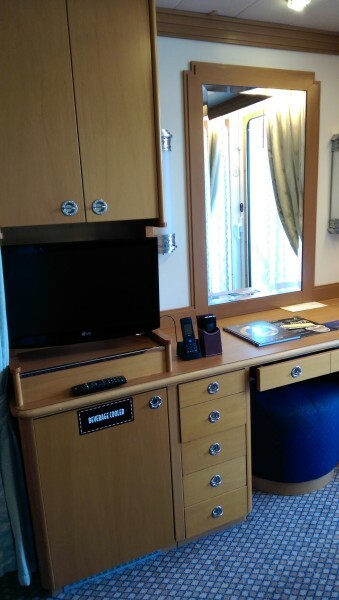 The phones on the desk are “Wave Phones” provided by Disney that work on the ship. Often your cell phones don’t have service or can’t be used on board. The little touches like the hidden Mickeys on the lamp, combined with tasteful nautical themes, made the room feel comfortable and attractive. The bathrooms were crisp, bright, large, and sparkling clean. We had two separate – one for the shower and one for the toilet, but both had sinks which gave us his and hers *smile*. A girl is happy with her own sink! All the extras were there, like the flexible shower head that could be used as a spray or a waterfall. Everything was five-star, including the H2O bath products. 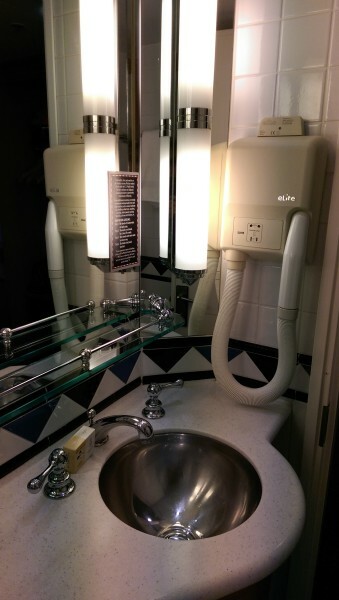 The hair dryer (big box on the wall with hose) on the ship is unusual, but I like how it worked! It felt a bit like a backward vacuum cleaner. A balcony, bathrobe, and breakfast are the perfect combination! 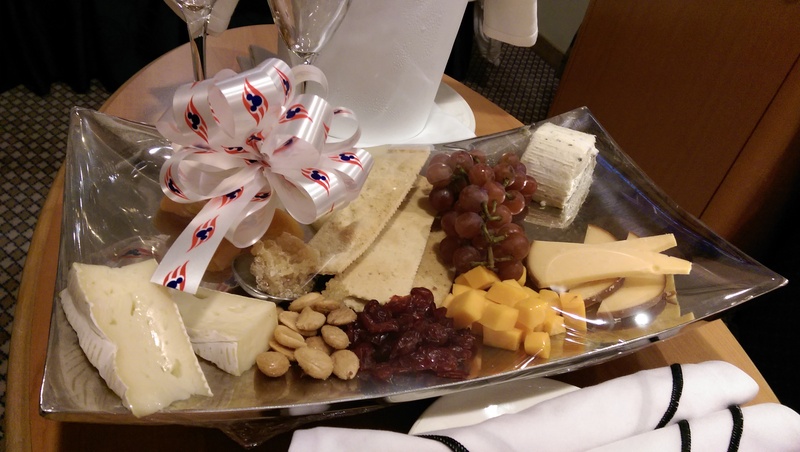 Several days, I ordered room service (included in your cruise price, nothing extra!) for breakfast and sat on the balcony. 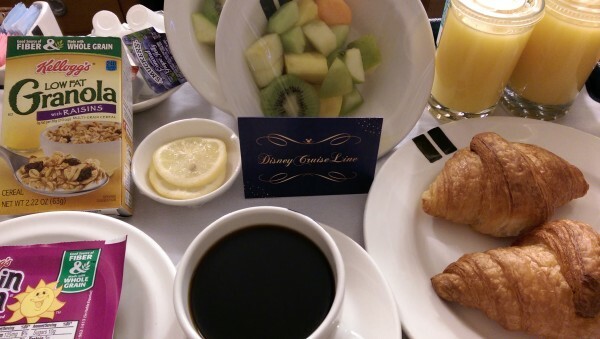 It was an incredible way to enjoy breakfast, watching the scenery, sipping coffee while cozy and comfy. 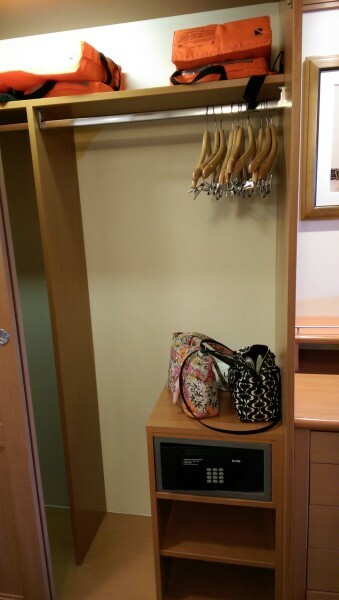 Have you ever stayed anywhere where the closet was big enough and they gave you enough hangars? I was very happily surprised to find that a cruise ship had both! (that’s only half the closet and half the hangars in the picture, there was another section to the left). Also, notice the safe, always nice to have. The two pictures above are the interior stateroom, where my mom stayed. It was very similar but with only one bathroom and obviously no balcony. But it felt very spacious, my mom said she never felt closed-in or cramped. 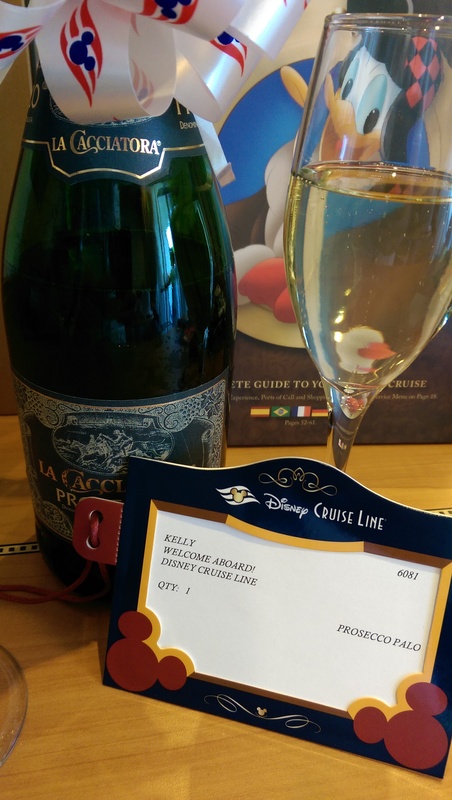 And then, to make my dream cruising complete, Disney treated us to…. I’m ready to book my next Disney cruise! I can’t wait to have grandkids (some day) and take them on a Disney cruise! Don’t you just kind of feel in awe of how well they use space on big ships? It’s pretty amazing. WOW! 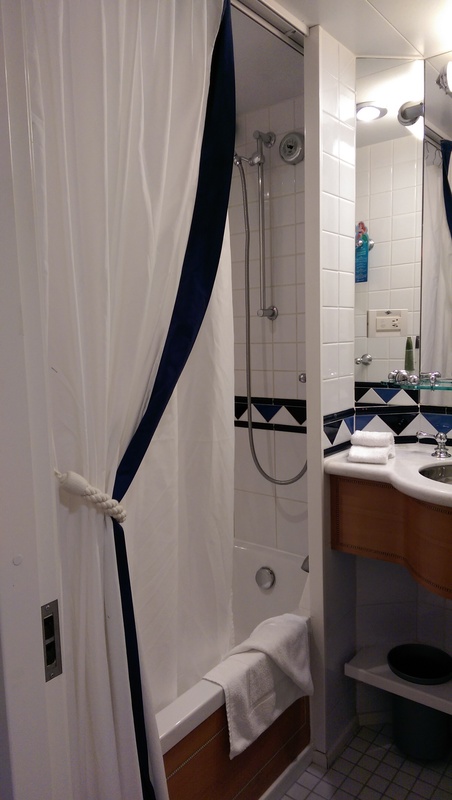 What a wonderful room with a lot of room and such a nice bathroom on a Disney Cruise. I can not believe how nice it is. I would love to take a Disney Cruise. It would be a blast! What a wonderful cruise. I love the fact that they serve the adults and cater to the children as well. It looks great. Now if only I didn’t get seasick. OMG, I am dying to go on one of Disney’s cruise but have not been able to save enough money yet. I have a family of seven so that is going to take me a while to save enough cash. The room looks so nice and so much nicer than other cruises that we have been on. Wow, great info. The rooms look nice and cozy, I have been wanting to go on a cruise but always worried the rooms would be small and cramped. 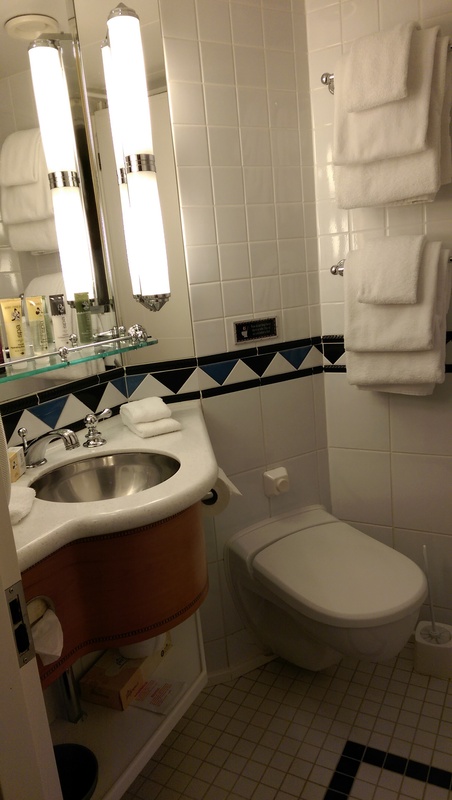 I’ve never been on a cruise, so it’s very interesting and helpful to see photos of the rooms! These rooms look so nice! I love the nautical and Disney details. I have never been on a cruise before, but the rooms on board this one seem amazing. I would love to go on one of these cruises some day. Very jealous. lol Hope you had an amazing time. 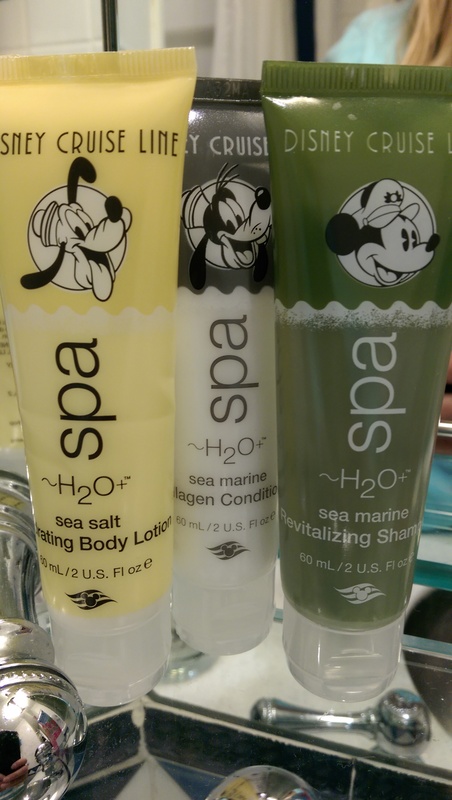 Love the H2O bath products, everything looks so good! Sounds like a great trip. We have cruised before, but never with Disney. Love all the space! It looks great. Sounds like you had a wonderful trip. The room looks beautifully decorated and very cozy! The bathroom is bigger than I expected it to be. This looks like fun vacation. The room and bathroom look really nice. 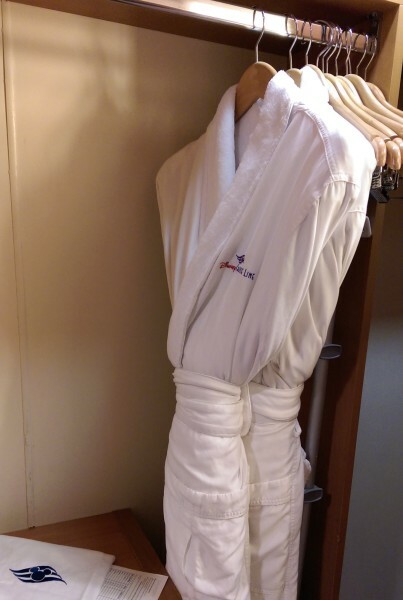 This is my first time seeing pictures of an actual cruise room, so thanks for sharing. I would love to go on a Disney cruise. The room and bathroom you photographed above look great — sounds like a fun trip! Looks awesome! I want to go on a cruise! I’m very impressed that there is a bathtub! 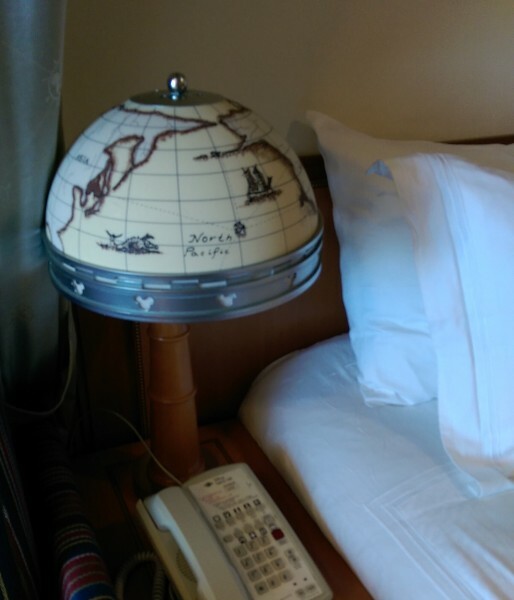 That’s a pleasant surprise on a cruise ship, but a necessity for families with small kids! 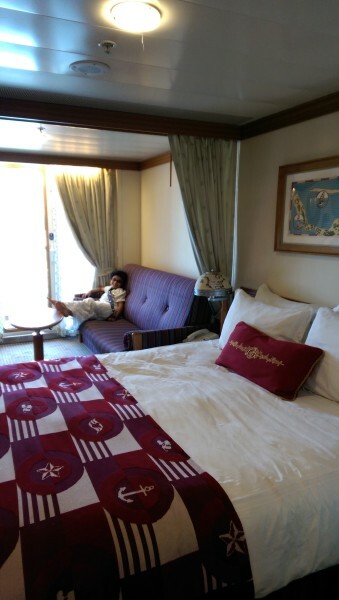 I never realized staterooms would be so large. They look very comfortable, with all kinds of amenities. I still haven’t been on a cruise. This one looks like a ton of fun. Wow, that’s really nice. I’ve never been on a cruise. I am surprised by how nice and spacious it is. I’m surpirsed by the size and decor of the room, so well done and I love how you had a balcony, eating breakfast on the balcony on a cruise sounds heavenly. I’m so jealous! The room looks beautiful! I had no idea there were so many great amenities. Looks like plenty of room. I always pictured them as cramped so you would want to be out exploring, but those look super comfy! You’ve got me in the mood for a cruise—Now I need to talk my husband into it. I want to go on a cruise and would choose Disney Cruise Lines. Great room. Very large! Love the sprinkles of Disney they added! Oooh everything looks so elegant, love it! Great room! I love Disney Curises. My family got to go on one and we have been wanting to go back. They are great for family vacations! Awesome, awesome, awesome! Disney is simply the best! The room looks great. Love to have a cruise now. There are some nice amenities on this cruiseliner. You have a lot bigger room than we had on our last cruise. Very nice and the toiletries are so cute! The room looks great. I like the shampoo and conditioner tubes. :) They’re so cute. I loved the split bathrooms on Disney and the lotion is one of my favorites. Wish I had gotten a new one of those every day! This looks like a really nice room, and lots of fun for the family to stay in and enjoy the great cruise. Wow the rooms are so nice!! The more of these pictures I look at the more I want to go. I love all the little extras that just make it over the top that they include. How amazing! I’ve never been on a cruise. The room looks spacious. I especially love the lamp. I haven’t been on the Wonder (only the Magic) but our room was totally comfy for 3 people! 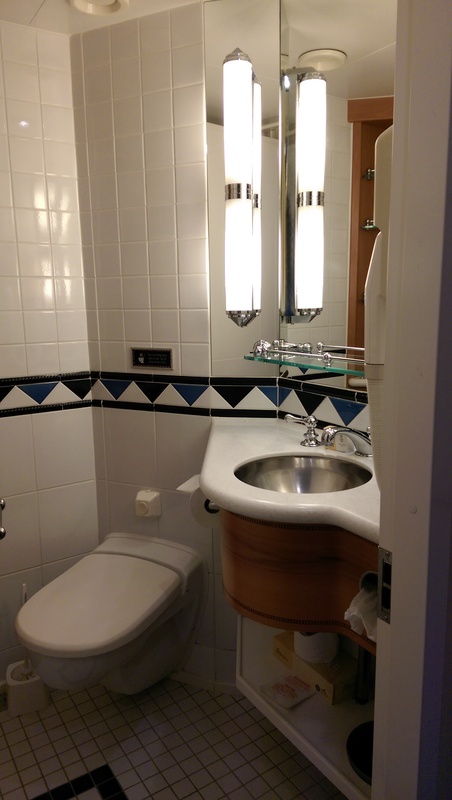 Love the split bathrooms, too! How nice! The room is big and spacious like you said. I like the theme as well! The hair dryer is pretty interesting! I am really surprised at the size and amenities of the room. I especially love the little patio. That is where I would have spent so much time, so I could take in the views. Great looking rooms. I think I’d love the balcony tho! Thank you again for the reviews. Ooh looks super cozy! Love that they gave you products for the bath. The rooms look nice, love the disney themed toiletries! The room looks amazing! Wish I were there! Wow that looks huge actually! I have never actually thought of the size of rooms on a cruise but this looks very spacious!! The bathroom is impressive. I was expecting something you’d fine in a RV. I always imagine the rooms on cruise ships would be tiny for some reason.This room is gorgeous and spacious!You are seriously making me want to book a cruise! I’ve never been on a cruise, but that room looks nice! Thanks for the peek. I love the balcony. I have only been on one cruise and unfortunately we didn’t have a balcony. I would love to go on a Disney cruise. Thanks for letting us see what it resembles. These rooms look incredible compared to the cruise I was on! You actually have room! I always imagined the rooms were tiny. This looks like a very nice room. I never thought about how nice the rooms would be. wow so nice and so much bigger then I ever would have be leaved for a ship room. i love the lamps. the whole room is alot nicer than i expected to see on a cruise. I always wondered how big the rooms are the are much larger and nicer than I had expected. I love the way that the room is laid out. 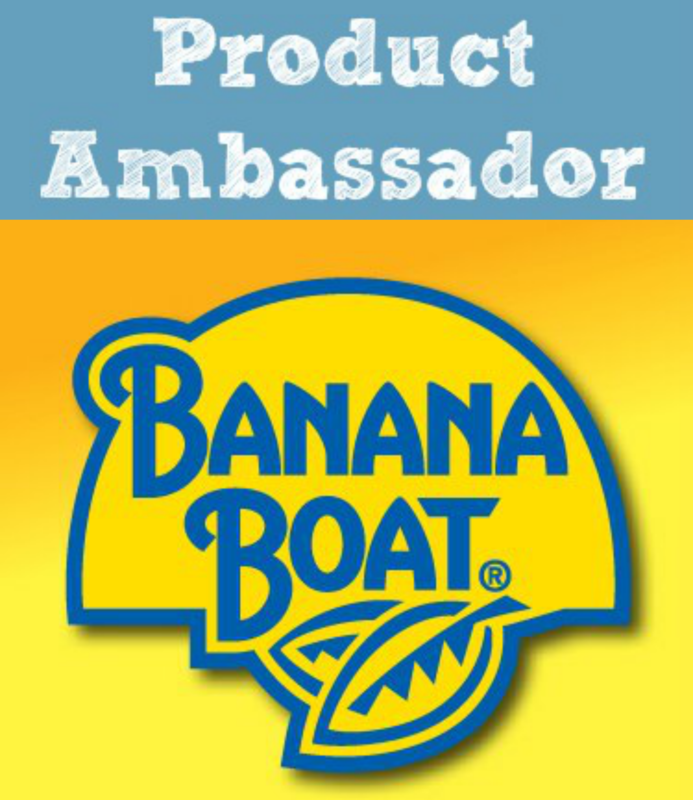 I have never actually been on a cruise but would love to take my family on one. I love your little private balcony! 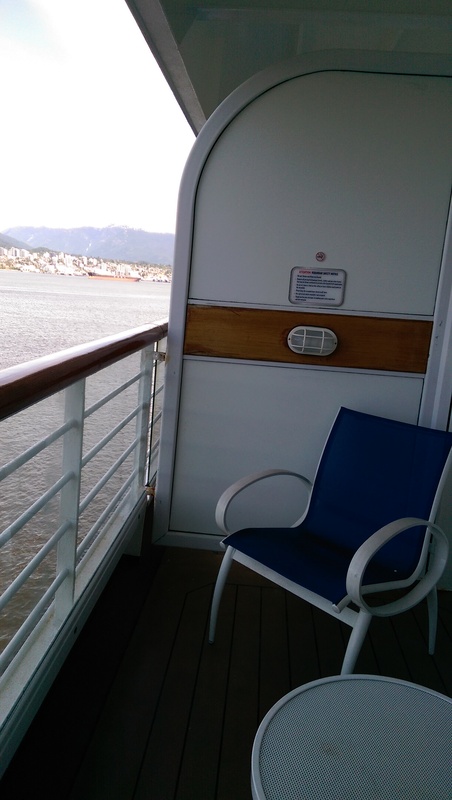 I’ve been on a cruise to Alaska but it wasn’t a Disney cruise. Lots of fun extras on your cruise. The room looks very nice and bigger than I thought it would be. Looks like a great cruise, I love the balcony!